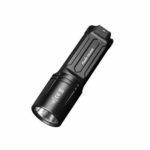 TK35 is a high-intensity multifunctional flashlight. 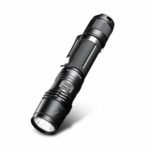 Utilizing CREE XM-L2 U2 LED, it delivers a max 960-lumen output and a max 355m long throwing beam with two 18650 batteries or four CR123A batteries. 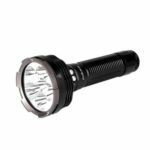 Offering 5 brightness levels, strobe and SOS function, dual tail switch, TK35 excels in various outdoor activities, such as exploring, camping, searching, caving and more. 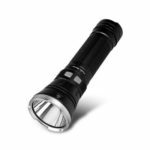 Utilizes Cree XM-L2 U2 LED with a lifespan of 50,000 hours, maximum output is 960 lumen. 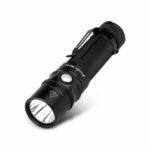 Uses two 18650 rechargeable batteries or four 3V CR123A batteries (Please note batteries are not included). 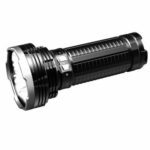 Digitally regulated output, maintains constant brightness. Low-voltage warning function to remind users of low power. Dual button switch in the tail for convenient operation.